It seems like just yesterday the first test tube baby was being born; the rapid advancement in medical research led to the discovery of numerous cures for congenital disorders. 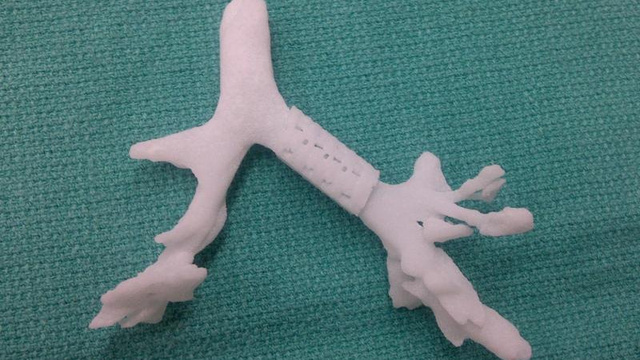 Recently with the aid of 3D printing, a cure was developed for tracheobronchomalacia, a rare condition which prevented children to breathe normally. When Kaiba Gionfriddo was born, his parents never expected their child to have a fatal condition which caused his windpipe to collapse daily. Kaiba had been born with the main arteries to his heart and lungs replaced which squeezed his windpipe, causing his breathing to stop and occasionally his heart too. After analyzing Kaiba’s condition, a team of researchers suggested that a 3D printer could potentially be the solution for his disorder. The researchers at the University of Michigan have been researching artificial airway splints but had never implanted one into an actual patient; desperate to save their son, Kaiba’s parents took the risk and the process quickly started. Though the risks were high and Kaiba’s parents were constantly warned there was a good chance he would not leave the hospital alive, the operation turned out to be a success. After 21 days of the operation, Kaiba has not had breathing troubles since. While it is not the first time 3D printing has had a positive effect in medicine, this event was an amazing feat as it offers huge hope for the 1 in 22,000 babies who suffer severe cases of tracheomalacia. The success of this operation will hopefully lead to the development of further objects aiding medical conditions, such as structures used in ear, nose and throat surgery.